The rolling aroma of processed grains, malts, and yeast fill the dimly lit bar as Justin “Judd” Eskildsen walks his way through the distillation tanks. It is here where the spirits are churned to perfection. He jokes with a few of the handlers, moves with broad shoulders through a set of doors leading to his office behind the quaint kitchen. His office, a table surrounded by boxes of ingredients and spices, is as modest and as he is. “Chances are I’ll never be a Michelin chef, but striving to be like my inspirations is what I do regardless,” Eskildsen said. 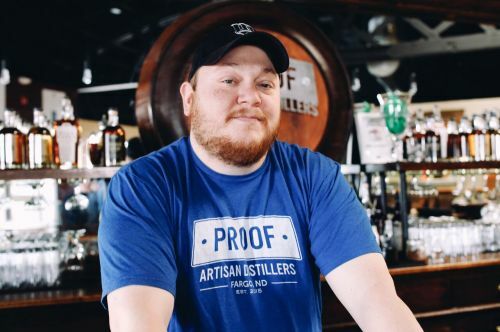 Despite his humble demeanor his culinary expertise has garnered him much acclaim around the Fargo-Moorhead area as he furthers his career as the executive chef at Proof Distillery. Proof Distillery was started in 2014 by Joel Kath who, on the advice of his friends, decided to take his love for spirits and high proof alcohol and pursue the challenge of starting his own distillery. One thing that always lingered in his mind, however, was the need for food to accompany the high level of alcohol the patrons would be consuming. Proof got so big, in fact, they have recently started distributing their alcohol in Arizona where some Fargo natives can seek it out comfortably in their flock, away from the bitter cold. Eskildsen’s vision is to expand the tastes of the typically Scandinavian-leaning public that walk in and out of the distillery’s doors. The first thing on his agenda was to remove any and all condiments that you typically find at chain restaurants across the country. “No ketchup, no ranch...salt and pepper aren’t on the tables...that was a huge problem right away. There were a lot of people asking for those things but I had to tell them we didn’t have any.” Eskildsen takes the responsibility of understanding what the consumer wants whether or not they are aware of it. It’s with this understanding that he crafts his food to fit the atmosphere inside the distillery as well as the needs of the public. It’s the level of high wire balancing that makes Eskildsen’s cooking especially tantalizing and inviting; he understands what you need. Eskildsen grew up engrossed in his mother's cooking especially when she, in the late 80s, took a class from Phil Wong, a locally beloved Chinese chef who showed his mother how to experiment with herbs and spices. She also ended up with this cookbook called Yan Can Cook. From that point on he grew curious and ventured to make his own meals starting at the age of 13 when he would ride his bike down to the local grocery store and pick out Italian sausages and pasta and try to make his own concoctions. He continued to follow his food passions until he took a detour as a unionized pipefitter and welder. For 12 years, the doldrums of the job wore on him and, by chance, he found himself on the path to regain his love for the culinary arts. Eskildsen, who wears his Danish last name proudly, is determined. His presence is contradicting, at once passive and intensely passionate, the perfect balance someone of his profession has to maintain in any bustling kitchen. When asked whether or not he thinks food is art his blue eyes glimmer with life.